Krishna appeared as the son of Devaki and Vasudeva in the prison of King Kamsa. For His safety He was transferred to the nearby village of Vrindavana where He grew up as the foster son of Mother Yasoda and Nanda Maharaja. 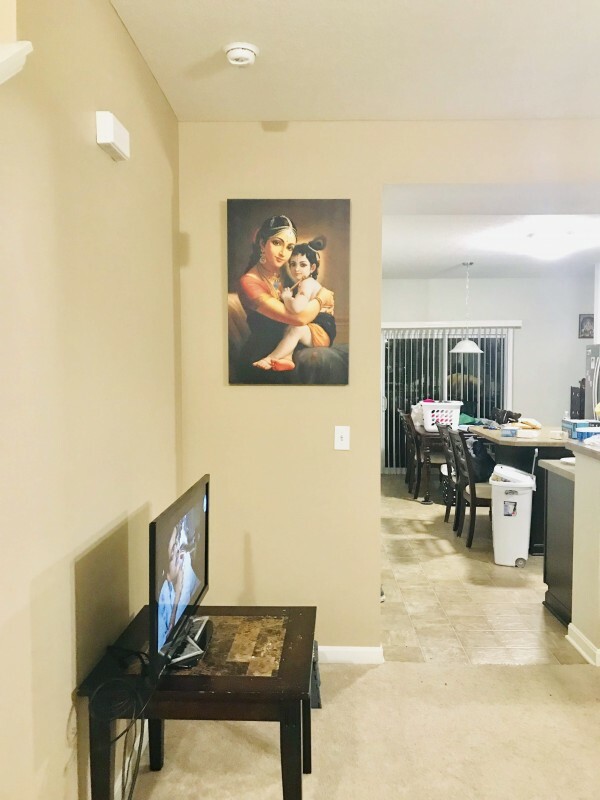 This painting shows Mother Yasoda with baby Krishna. In the incarnation of Krishna, although He was the son of a king, Krishna at once left the shelter of His real father and mother (King Vasudeva and Queen Devaki) just after His appearance and went to the lap of Mother Yasoda in Vrindavan to play the part of an ordinary cowherd boy in the blessed Vrajabhūmi, which is very sanctified because of His childhood pastimes. Therefore Lord Krishna is more merciful than Lord Rama. He was undoubtedly very kind to Kunti's brother Vasudeva and the family. Had He not become the son of Vasudeva and Devaki, Queen Kunti could not claim Him to be her nephew and thus address Krishna in parental affection. But Maharaja Nanda and Mother Yasoda are more fortunate because they could relish the Lord's childhood pastimes, which are more attractive than all other pastimes. 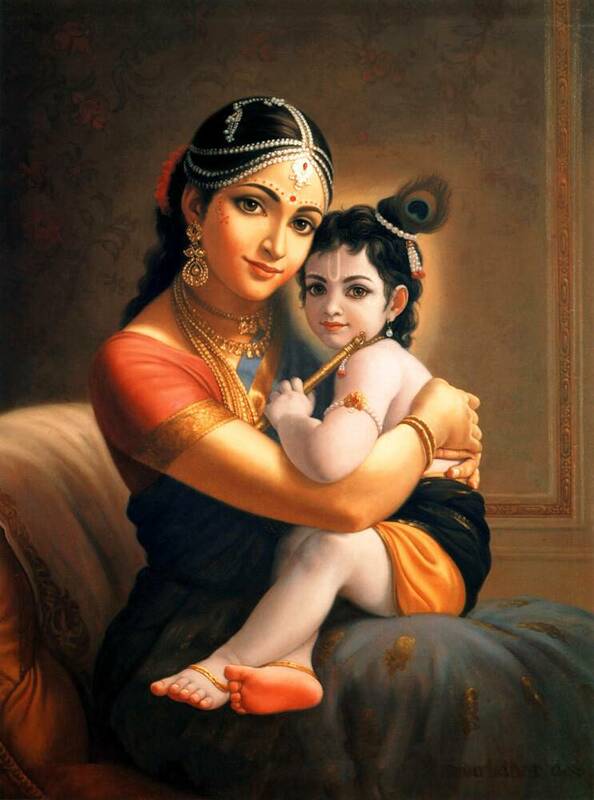 There is no parallel to Krishna's childhood pastimes as exhibited at Vrindavana, which are the prototypes of His eternal affairs in the original Krishnaloka described as the cintamani-dhama in the Brahma-samhita. Lord Sri Krishna descended Himself at Vrindavana with all His transcendental entourage and paraphernalia. Sri Caitanya Mahaprabhu therefore confirmed that no one is as fortunate as the residents of Vrindavana, and specifically the cowherd girls, who dedicated their everything for the satisfaction of Krishna. Krishna's pastimes with Maharaja Nanda and Mother Yasoda and His pastimes with the cowherd men and especially with the cowherd boys and the cows have caused Him to be known as Govinda. Lord Krishna as Govinda is more inclined to the brahmaṇas and the cows, indicating thereby that human prosperity depends more on these two items, namely brahminical culture and cow protection. Lord Kṛṣṇa is never satisfied where these are lacking. Question: Is it actual photo size or you have some specific width boundaries as well after photo? Question: Hi, who is the artist of these high quality pictures?